In Belize, the former British Honduras, a small country in Central America that occupies the south-east of the Yucatan Peninsula, the climate is tropical, with a hot and rainy season from June to October, and a cooler season from November to February. In the latter period, the northeast trade winds prevail, but they are still able to unload some rainfall, especially in the first part, while later the rainfall gradually decreases, so that from February to April it's the driest period of the year. From March to May, before the rainy season, the heat gradually increases, so much so that in April and May the hottest days of the year occur, and there may be scorching days, especially in inland areas. In May, thunderstorms become a bit more frequent as well, especially in the south, where the rainy season actually begins. The rains occur mainly in the form of downpours or thunderstorms in late afternoon, at least in the hottest period, while in December and January they are less abundant but more prolonged. So, the sun shines for a few hours a day even in the rainiest months. 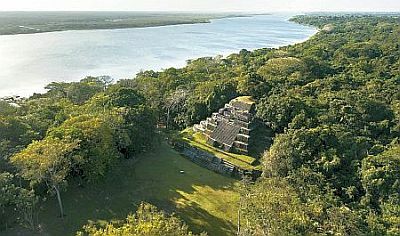 Owing to both rainfall and humidity, most of Belize is covered by a tropical forest. During the coolest months (December, January and February), the average temperature is around 23 degrees Celsius (73 °F) in the north, 24 °C (75 °F) in the south and 25 °C (77 °F) on the island of Ambergris Caye, with highs around 26/27 °C (79/81 °F). From December to March, the country is sometimes reached by the Norte, a wind coming from the United States, which can bring a bit of cloudiness and rainfall, and also a bit of cool weather in the evening and at night, to the point that the night temperature can drop to around 13/15 °C (55/59 °F). In the rainy and sultry season, from June to October, the daily average temperatures are around 27/28 °C (81/82 °F), with highs around 30/32 °C (86/90 °F). The rains increase progressively from north to south. In Consejo, in the far north (Corozal district), rainfall amounts to 1,300 millimeters (51 inches) per year, in Ambergris Caye (an island in the north) it amounts to 1,800 mm (70 in), in Belize City and Belmopan (in the center) to 1,900 mm (75 in), in Dangriga (formerly Stann Creek Town, on the central-southern coast) to 2,200 mm (86 in), while in the extreme south, in the Toledo district (see Punta Gorda) the rainfall exceeds 3,000 mm (118 in) per year. In the center-north, sometimes there is a pause in the rains in August (called Mauga). In Punta Gorda, in the far south, the rains are already abundant in May, since they amount to 190 mm (7.5 in); moreover, they become torrential from July to September, when they hover from 450 to 600 mm (18 to 23.5 in). In the south, in the area of the Maya Mountains, the sky is often covered with clouds. Here the dry season is less pronounced because the northeast trade winds are forced to rise over the mountains, forming clouds and rains. The weather becomes a bit cooler as you climb the two highest mountains of Belize: Doyle's Delight and Victoria Peak, both around 1,100 meters (3,600 feet) high. Here are the average temperatures in Belize City, located in the central part of the coast. As mentioned, precipitation in Belize City amounts to 1,900 mm (75 inches). Here is the average precipitation. The sea in Belize is warm enough for swimming all year round, in fact the water temperature ranges from 27 °C (81 °F) between January and March, to 29 °C (84 °F) in the summer months. In the interior, the temperatures are somewhat lower on winter nights, while they become higher in the period preceding the rainy season, from March to May, when the heat is often intense. Here are the average temperatures of Belmopan, the capital city, which is located in the plains, 50 km (30 mi) away from the coast. As mentioned, in Belmopan around 1,900 mm (75 in) of rain fall per year. Here is the average precipitation. The amount of sunshine in Belize is not excellent, however, it's just acceptable in winter (when there are about 5/6 hours of sunshine per day), while it becomes good in the dry season (with about 7/8 hours a day), except in the aforementioned Maya Mountains, which are often cloudy. Here are the average sunshine hours in Belmopan. 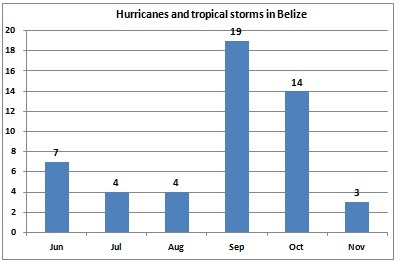 In the period from June to November, Belize can be affected by tropical storms and hurricanes, which, however, are more frequent in September and October. The most exposed part is the central-northern one, which includes the small coral islands (cayes), while the south is somewhat protected by nearby Honduras. A hurricane that hit Belize in a particularly intense manner was the "1931 Belize Hurricane", which devastated the country in September 1931. Other intense hurricanes were Janet at the end of September 1955, Hattie at the end of October 1961, Keith at the beginning of October 2000, Iris in October 2001, Dean in August 2007, Richard in October 2010, and Earl in August 2016. In the following table, we can see the number of hurricanes and tropical storms that have affected Belize in the last 100 years. The best time to visit Belize for a beach holiday, and for exploring atolls and coral reefs, is from February to April, in fact it is the period when the rains are scarcer, and the heat is not as muggy as in the following months. January falls in the cool period, although it is a bit rainier, but overall you can also go in this month. To go in search of the Mayan ruins, in March and especially in April the heat can be intense in the interior, though on the positive side we are in the middle of the dry season. From May to October, in addition to the rainy season, you must take into account the sultry and unpleasant heat. From June to November it is useful to recall the risk of hurricanes, which as mentioned are most likely in September and October. From December to March, bring light clothes, but also a sweatshirt or sweater for the evening and for windy days. From April to November, bring tropics-friendly, loose-fitting clothing, light shirts and pants, comfortable and breathable shoes, a sun hat, sunglasses, and also a light sweatshirt and a light raincoat for thunderstorms. See also the Mexican side of Yucatán.